With a dash of balsamic. Double layer of compote. Thick 'n' creamy. Natural ingredients. British milk. Gluten free. Vegetarian friendly.A strawberry yoghurt like no other! 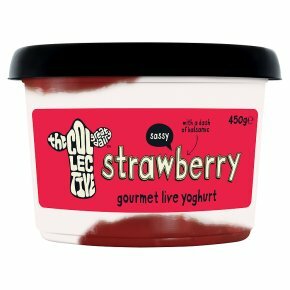 A li'l sharp yet sweet, our signature thick 'n' creamy yoghurt rests between generous layers of chunky strawberry compote that has a dash of balsamic vinegar, givin' it rather magical lift. Oh strawberry, you so do taste of a warm summer's day, no bull!